Snowballs at Santa Claus! This has got to be one of my top 5 grievances. 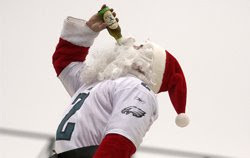 Why is it that every time I watch a Philly team on TV I have to listen to the announcers talk about Philly fans throwing snowballs at Santa Claus. There have been at least 20 fan/player/entertainer incidents that warrant more attention than this does. When a Detroit team is getting boo’d you never hear them say these are the same fans that started a bench clearing, fan punching fight during a basketball game. When Chicago fans boo their teams the announcers never mention the fans that stumbled out of the stands and attacked the first base coach. Enough is enough with the Santa crap, if you are a journalist and mention this it only proves you are lazy and don’t do your homework as a journalist. The worse part about this story is I have yet to hear it told accurately. Maybe I’ll get into the whole story sometime during the football playoffs if we have a snow game. But for now I’ll say this scrub Santa deserved to have snow balls thrown at him.